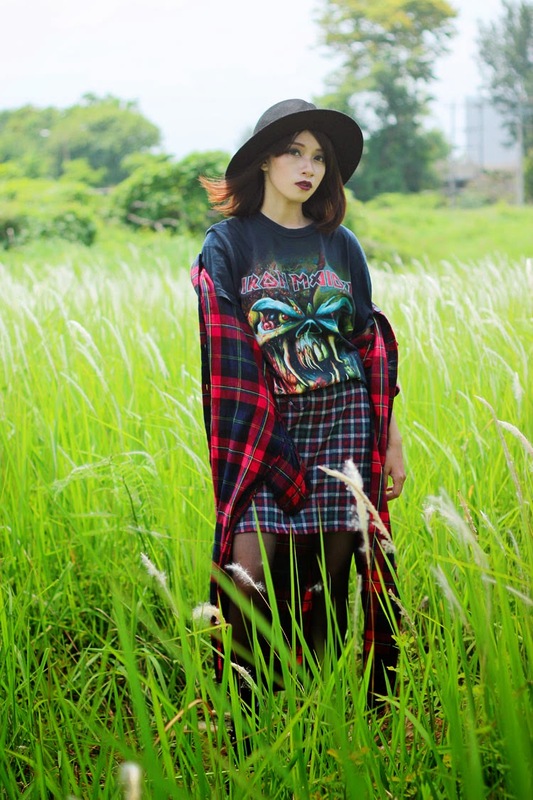 I have no idea what should I wear yesterday untill I found this plaid skirt and then my other plaid long shirt, so excited about it, wear plaid on plaid I think it's not bad at all, paired it with my favorite band tee, and wear dark lipstick in the afternoon, lately I really obssesed with dark and red lipstick, and I bought so many red lipstick, and what comes in my head is.. I should buy black lipstick, yash or nah? It's great 'cause the sun is shining bright, and there is no longer a low/ bad light in my photos, It's looks like summer photos right? Cause I know it's a fall season but I live in Indonesia and it's summer forever. This is such a gorgeous look. I absolutely love the layering. madly in love with your long tartan shirt!!! cool look!!!! I have a similar t shirt of iron maiden oyeah ♡ love it! I love your shirt, makes the whole outfit look more edgy! Yassh you should buy black lipstick, love this look! This is such a great look! Love the plaid shirt. Wow I love your shirt, makes the whole outfit look more edgy! yasshh, you must buy black lipstick kak, i think that will so cool for you.. In love with this look! The plaid on plaid is perfection! Totally crushing on this look...........pure perfection. Loving the plaid on plaid, makes for a surprisingly cool combo! Love this outfit!! so special! oooooh such a rad combo! definitely love this plaid on plaid mix! You look so cool!!! I love this outfit <3 I like the plaid on plaid action you got going on. And that Iron Maiden tee rocks! Such a great outfit! I love the mix of plaid! Awesome outfit- love the contrasting patterns! Thank you for your amazing comments, hun. Thank you for your comment on my blog dear! You look amazing, love this boho-gringe look you created!! I think the dark lipstick looks better on brunette girl but I dont like the black one! Thanks for your lovely comment dear, I am your new follower on GFC and Bloglovin and hope you follow back! Great look! I love all items! 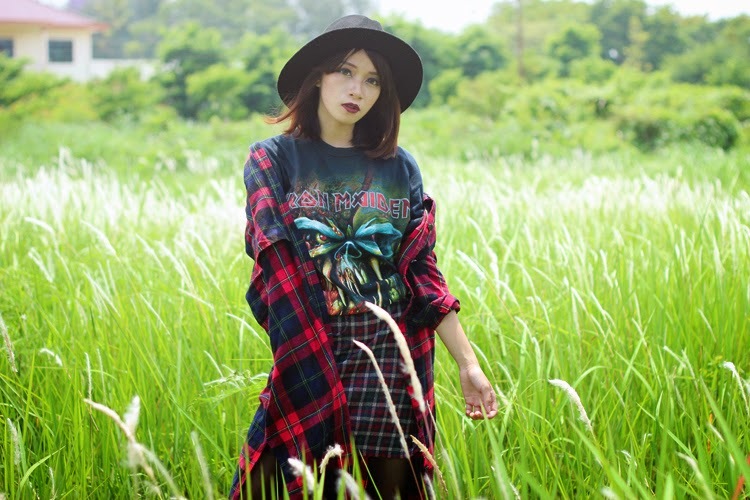 Great edgy look and your pictures are beautiful! You look absolutely gorgeous! Love this outfit! 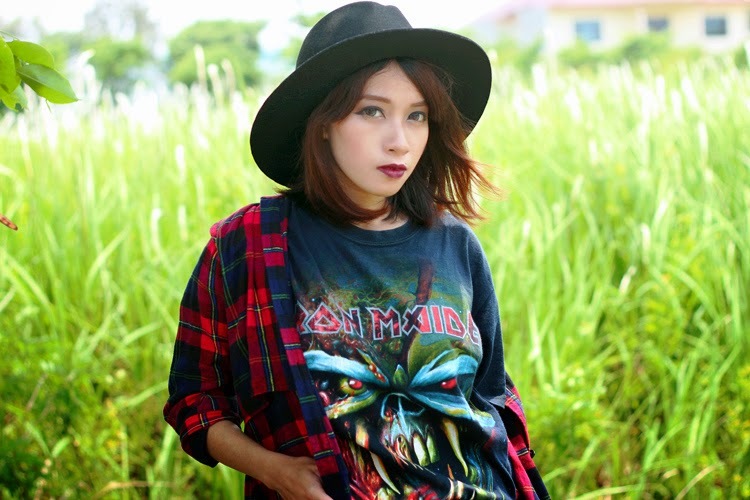 This grungy look is amazingly perfect! I love the shirt! So unique!